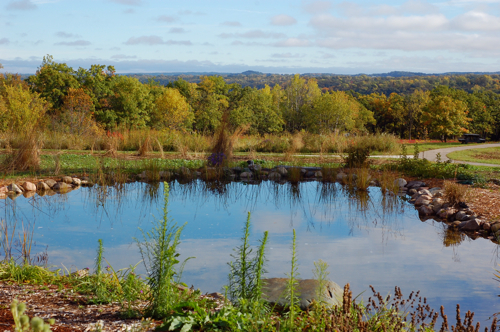 Friday was an unbelievably beautiful day at Carpenter Nature Center. I ended spending way more time out there than anticipated. It ended up being a perfect day and now as I look outside my window to see TWO inches of snow with more on the way, I'm glad I took advantage of the fall color and sunlight even if it never made it to 40 degrees. And yes, I did just type two inches of snow. That's a bit insane even for Minneapolis standards. I'm prepared for snow when Halloween hits. But not on October 12. Sigh, if you take into account that five inches in April is a normal occurrence, that means that we have six months of winter ahead. Mental note: Plan a trip to Panama and possibly Peru this winter--who is in with me on this? We haven't even gotten our full fall color in the Twin Cities yet. You can see in the above photo that we are right on the cusp. I think all this snow will make all the leaves say, "Screw it!" and just drop off the trees. 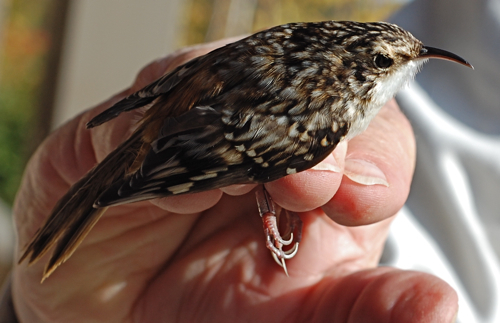 Banding was awesome--I got to band a brown creeper--who make sad little chirps in hand. It was a hatch year bird, hope it finds a way to survive the winter and is recovered by another bander some day. We also got in our first junco of the season. We normally get those in little Potter traps. 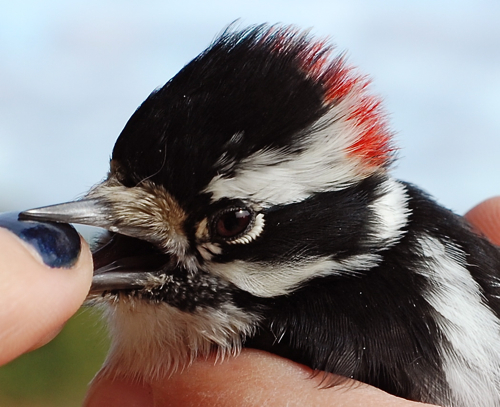 It was weird taking one out of the mist nest (we only use mist nets in warmer weather at Carpenter). 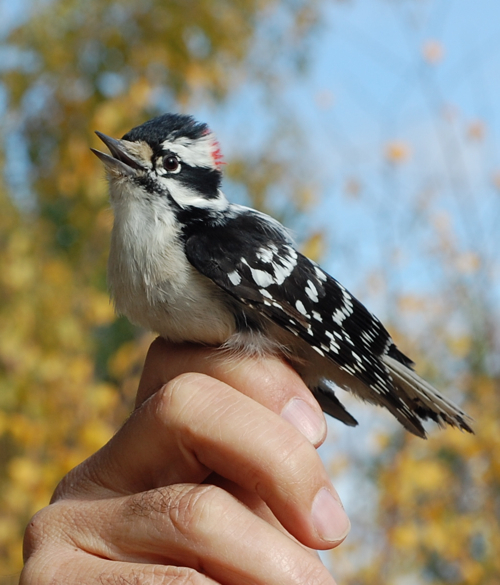 My buddy Larry processed a downy woodpecker that I originally banded in May. That was exciting. When I banded it him in May, I aged him as a second year bird but according to Pyle and his fall plumage he was resembling an after second year bird. Part of it was his eyes. In the sun, they looked very red. Although this photo shows them to be more brown than red. It's always nice to find an older bird and to have it surviving well. As Larry and I walked around checking the nets, we watched a fascinating interaction among the birds. 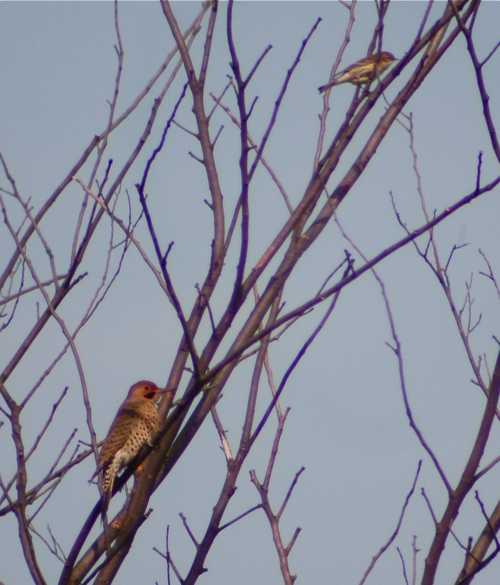 Migrants like the above northern flicker and yellow-rumped warbler were all over. We heard some blue jays and crows crabbing at each other. The crows were half heartedly mobbing something, but the blue jays sound a bit more on alert...a bit more like they do at the hawk blind when a sharp-shinned hawk is perched nearby. Then Larry and I heard a flicker give a distress call. We walked over to investigate and sure enough, a shin was actively hunting among the trees. 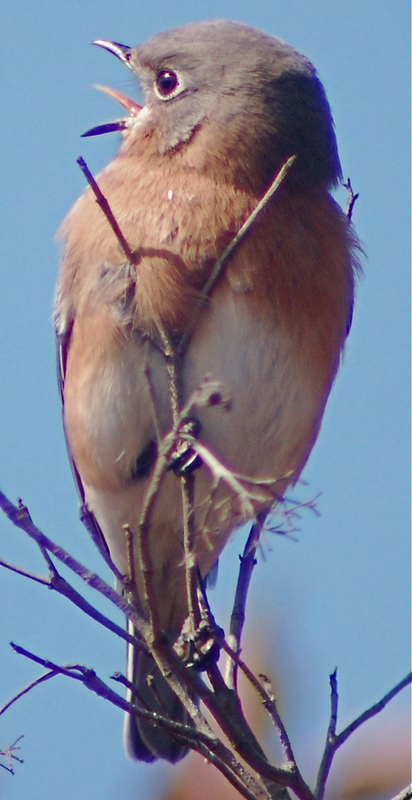 He perched in the open momentarily and is was a juvenile male shin (barely the same weight as a flicker). He was in hot pursuit of flickers, but all of them were on to him and could out fly him. Shins, especially larger females can nail a flicker, but they need element of surprise. The male shin would chase a flicker, it would give the distress call while the shin chased. As soon as the shin would perch, another flicker would fly right in front of it--almost taunting it. The blue jays would scream and yell like townies at a bar encouraging a fight. What was really interesting was a pileated woodpecker flew into the scene and perched near the shin, keeping a close eye. I've seen this before. I've seen pileateds creep towards a shin and even a male Cooper's hawk that is on the same branch and in both instances chase it away (it's a big woodpecker and I think it's size and bold approach freaks out smaller hawks). The pileated flew off and the shin gave chase--I don't know what it thought it would do if it actually had a pileated in its teeny talons. The pileated easily out flew the shin and perched in a tree. A second pileated hidden nearby gave a soft call, almost as if asking, "You still there?" The chased pileated called back and then took flight, circling the tree that the shin was perched in. The poor male shin finally gave up and took to a thermal and circled high and out of view. My advice small male sharp-shin? Stick to sparrows and warblers. A lot of birds were crabby--perhaps they knew better than I did that snow was on the way? 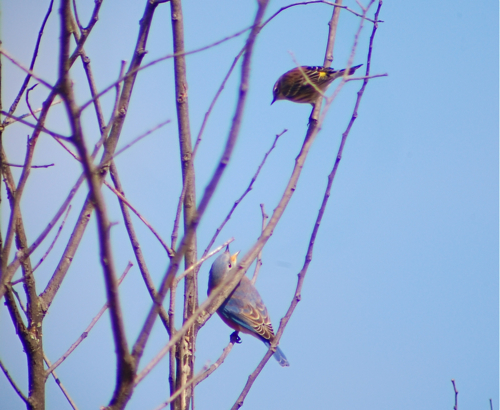 Above a yellow-rumped warbler was trying to drive an eastern bluebird out of a tree. The bluebird crabbed back at it. The yellow-rump still mobbed the bluebird and eventually the bluebird lunged and chased it off. 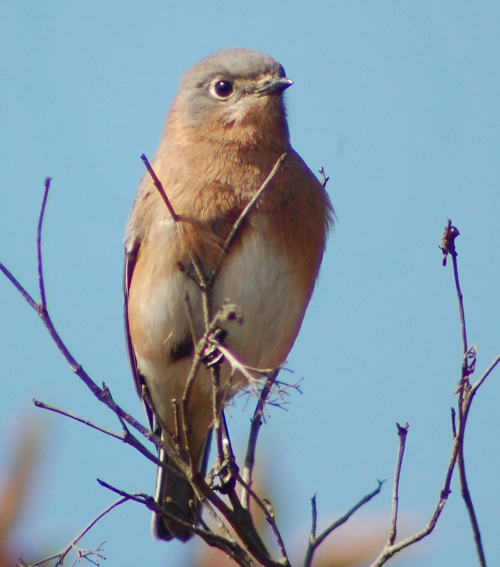 I spent the better part of the afternoon with the bluebirds. They have a great palette to begin with, but I wanted to try and get a picture of that beautiful bird with the fall colors behind it. This bird was most uncooperative. Okay, so perching withe the blue sky behind it does make a statement. But it kept coughing up berries. I'm not sure what's going on with that. I've seen berry eating birds like robin, waxwings and thrashers do that when they are in the midst of chowing down on a bunch of berries. 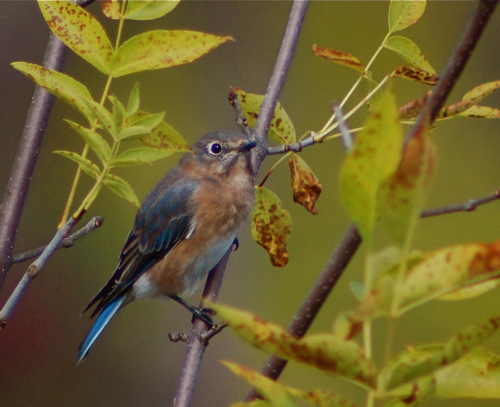 The bluebird were raiding the larder of fruit on the dogwood. It's funny, a fellow birder on Facebook had announced on this status the day before that a great front had moved in so watch the dogwood bushes for birds. 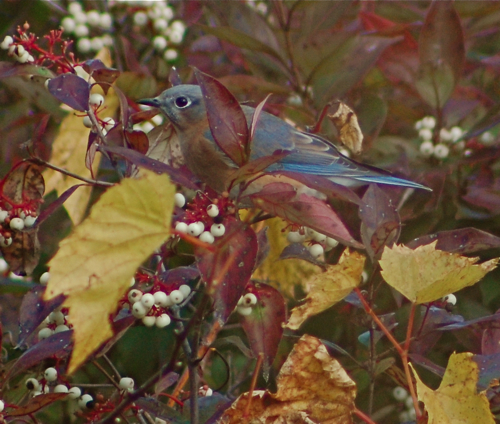 I love hanging out around dogwood in the fall. Tons of birds eat the berries and all kinds of sparrows will pop out from beneath them. While chasing bluebirds I saw chipping sparrows, Lincoln's sparrows, fox sparrows, field sparrows, and one robust Harris sparrow mixed in among them. 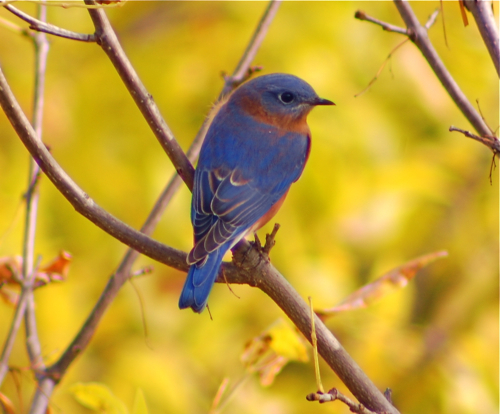 The flocks of bluebirds would drop down and hover over the dogwood and then disappear in the foliage looking for berries. It was a perfect day for digiscoping.